Thank you to the men and women who have served in the armed forces to defend our freedom! We appreciate and respect all of you. For those who have lost a family member, friend and fellow comrade, we salute you and will always remember them. God bless you and God bless the United States of America! PEONY FIELD DAYS ADDITIONAL DATES! 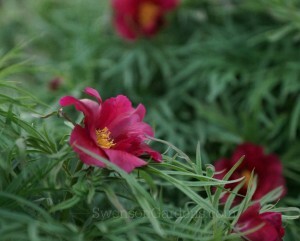 Friday, June 10th and Saturday, June 11th from 9 am to 5 PM have just been added to our Peony Field Days! So if you cannot make it on Friday, June 3rd or Saturday, June 4th, we’d love to see you here a week later! Again we are not open on Sunday’s so June 3, 4, 10 and 11 are the only days we are open to the public. Address is 10958 70th St SW, Howard Lake, MN 55349. More info will be posted this week on bloom time and condition of the field. Looks like more rain in the forecast this week so hopefully we can get into this field at some point this week. For those of you who have never been to our Peony Field Days, you are walking in the actual peony field versus in a nursery center. Yes boots, hopefully sunscreen, bug spray (make sure to spray it on in the parking area and not in the peony field), camera and dogs are surely welcome if kept on a leash. 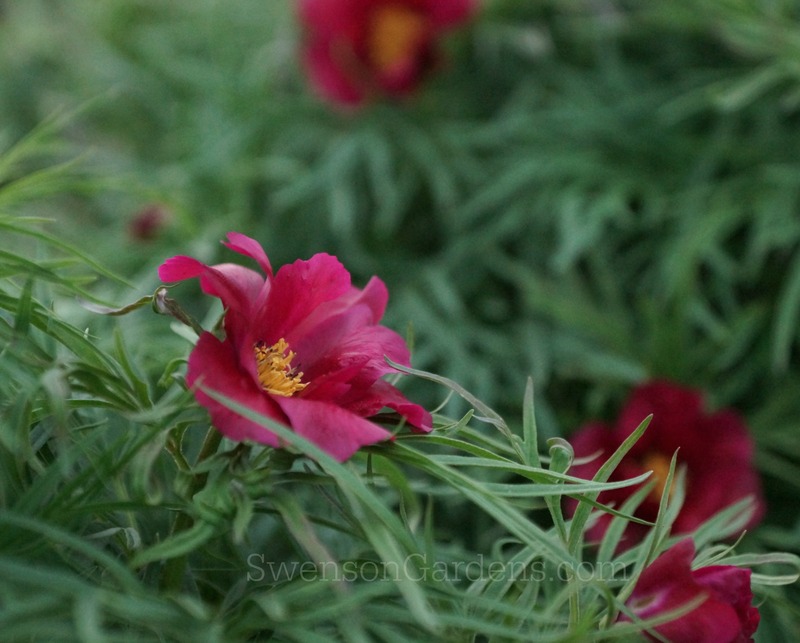 See you at Swenson Gardens 2016 Peony Field Days! The skies cleared up for a few hours this evening for some intersectional hybrid peonies photos. 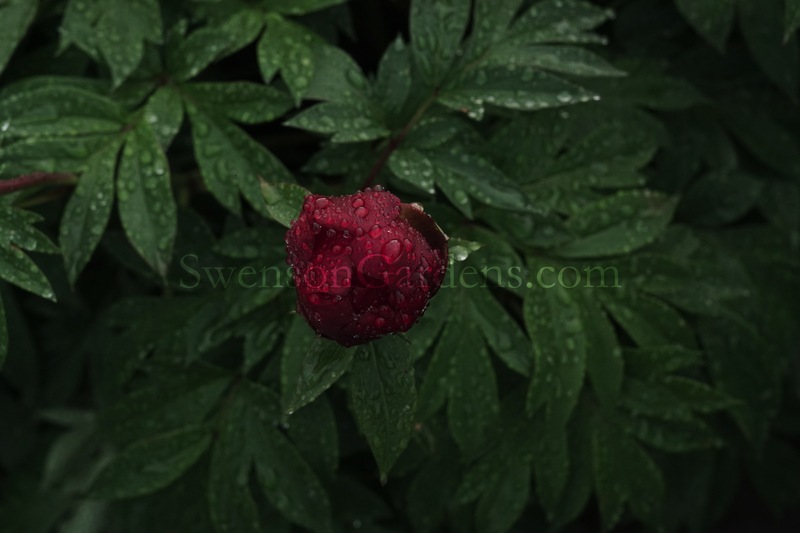 Ok so a few raindrops are wonderful on peony photographing, but I think we are now over 6 inches of rain since Monday evening. Thankfully the weather looks more promising so we can begin to dry out. I just couldn’t pass up the light and texture of the raindrops to FINALLY be able to photograph some peonies. Apparently the intersectionals do not realize that we haven’t seen the sun much this week but opening up in the rain makes for tough photography. This photo represents the perfect combination of primary and secondary bud phases. The larger bud is the primary and the smaller one is the still developing secondary. The smaller one is also known as the ‘side buds’. This combination will provide an extended bloom time IF the hot sun does not speed up the bloom time. There are some intersectional hybrids that are starting to show some color. It is fun to see some of our new seedlings colors that the master hybridizer, Roger Anderson has developed. Looks like the next couple of days are rain free so will update on our June 3rd and 4th Peony Field Days soon. This will give our peonies and ground some much needed drying out time as we’ve been soaked most of the week. It is amazing though to truly see how the intersectional hybrids and herbaceous ‘no staking’ peonies have held up this week! 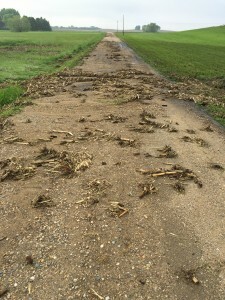 Peony field jottings…the day after the storm! Thank you to those of you who chose to pray for our peony farm last night! Ours and your prayers were answered! What could have been an early season disaster turned out to be better than what we thought last night during the height of the storm. 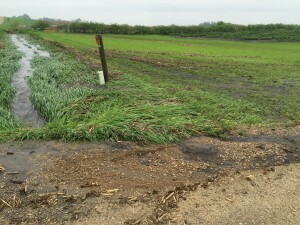 NO HAIL DAMAGE which is a big one for peonies and NO STANDING WATER IN THE PEONY FIELDS! PTL!!!!! 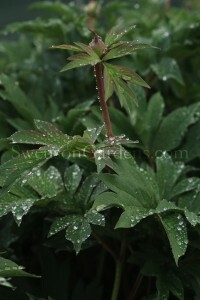 For all peony gardeners, standing water for more than 24-hours is not conducive to peonies survival. 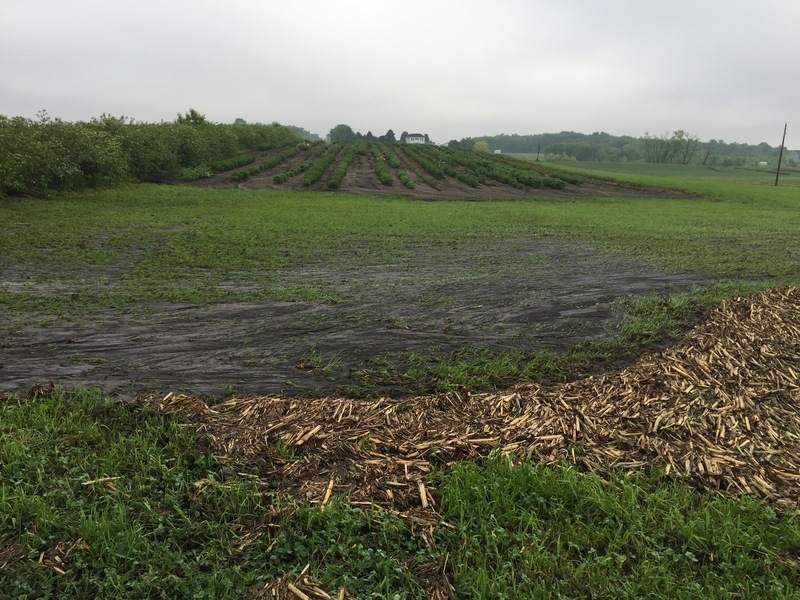 The peony field for our upcoming Peony FIeld Days is very wet but 99% of peonies made it. Don’t you just love peonies…especially the no staking ones? Speaking of no staking peonies, the peonies in the first two rows are the infamous intersectional hybrid peonies! With the 55+ mph winds last evening that moved one of our trailers into a pine tree, they are still standing tall, the intersectionals and no staking herbaceous are looking great! 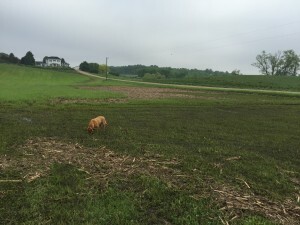 If you look back to one of my early spring posts regarding our windrow/buffer zone, you can now see in this picture why we do this on our west property line. The Dogwood shrubs did their job! 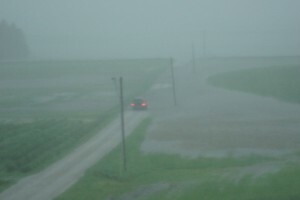 Yes some of the topsoil from the neighbor to our west came through but not to the extent that could have been. Thank goodness for this buffer line next to our peony fields! 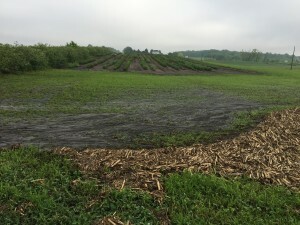 What use to be a lake last night is now left with the cornstalk stubble from our neighbor. Redd was rather bewildered as his lake is now empty with no water left to play in like last night! 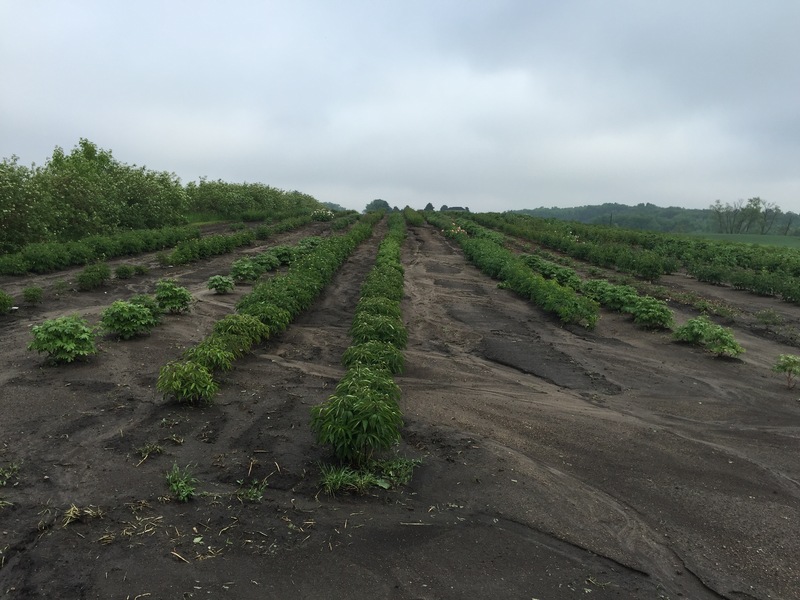 Peony farm jottings…the day after the storm! Well peony gardening friends, we are now water free on both sides of our driveway and in the repair mode now. 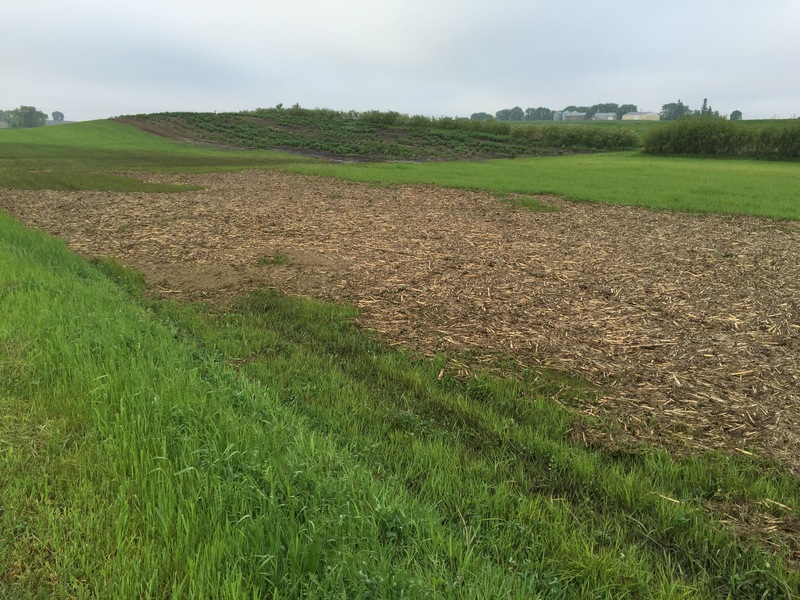 Looking to the west of our property line in the middle picture details the source of most of the water flow. 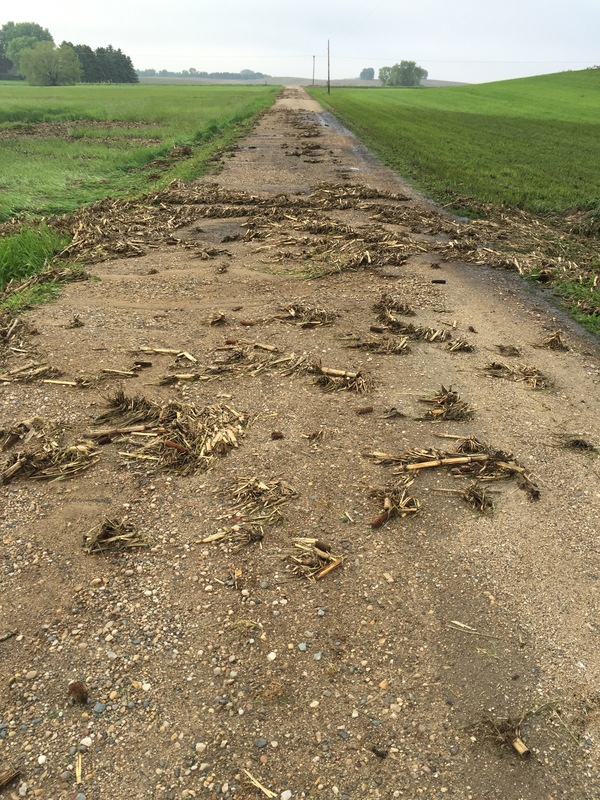 Yes tiled crop fields that empty into the only exit that should have gone through our 36″ diameter culvert. 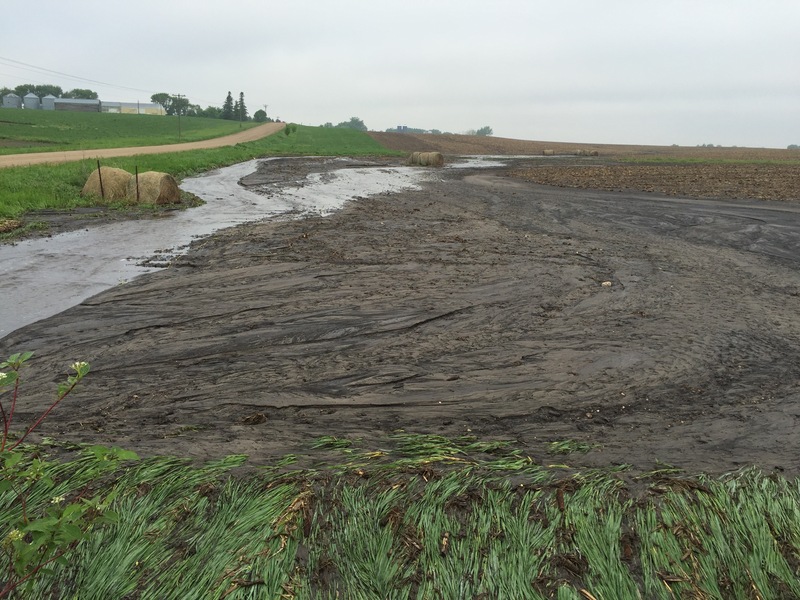 However with 5″+ of rain in three hours, even a 72″ diameter culvert could not keep up with the water flow from 200+ acres of tiled crop fields. 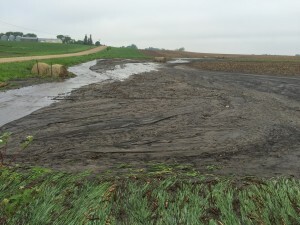 The amount of topsoil erosion to the west of us is very sad to see for our neighbor. 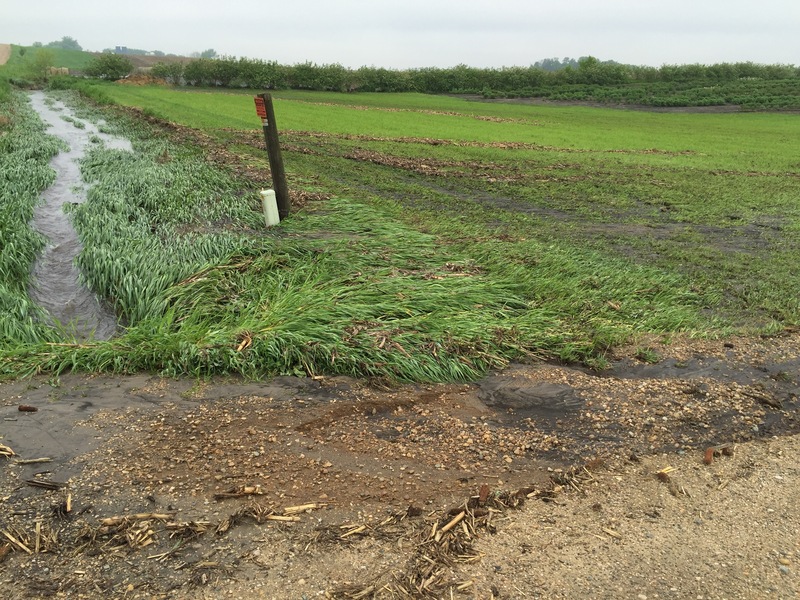 Perhaps some cover crops and erosion control may be advisable. We like free topsoil but only if it is chemical free for our peonies! 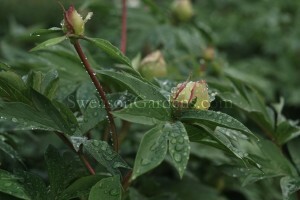 We get it when the rains come down but not so much when the floods come up on the peony farm! The last 2 1/2 hours have been crazy here with all the rain, wind and hail. Inches fell in this time period unlike we have never seen in the last few years. Luke and I ventured into the storm to see what all the water on the west side of our driveway was all about. Needless to say the closer we got the more interesting it became. 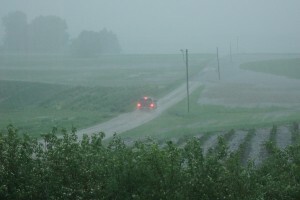 A river of water had breached over our driveway as the culverts could not keep up with the flow. Yes our driveway was still somewhat intact; however about 8″ of the top layer of the driveway is gone. Where the farthest telephone pole is located is 70th street. 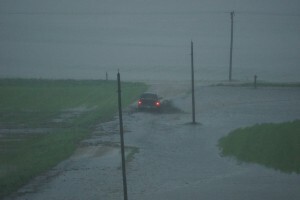 What use to be a newly planted cornfield on the other side of 70th st is now a lake. 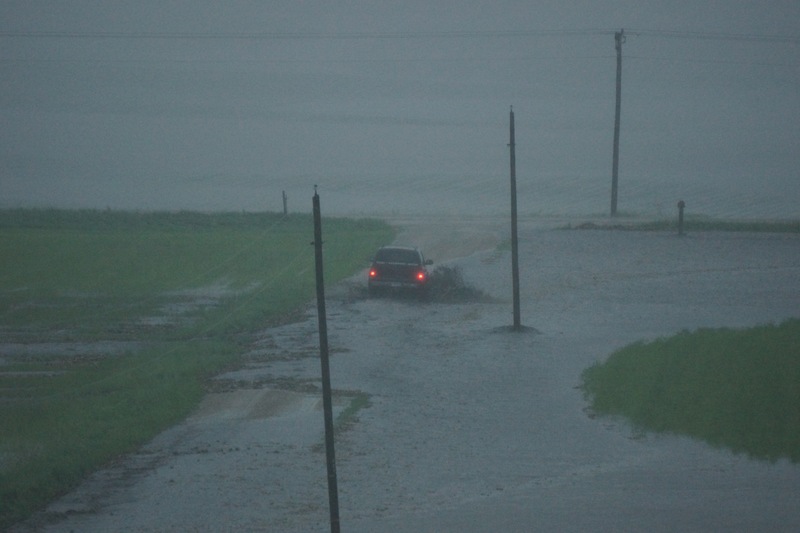 The 36″ culvert at the end of our driveway could not keep up with the water flow so we now have a lake on the west side of our driveway too. We also received some wind damage by our home that moved one of our trailers about 15 yards into a pine tree. 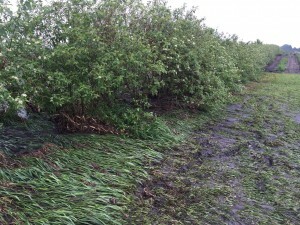 We haven’t been able to assess the peony fields as the storm is still going on. If you so choose, please pray for our peony farm. 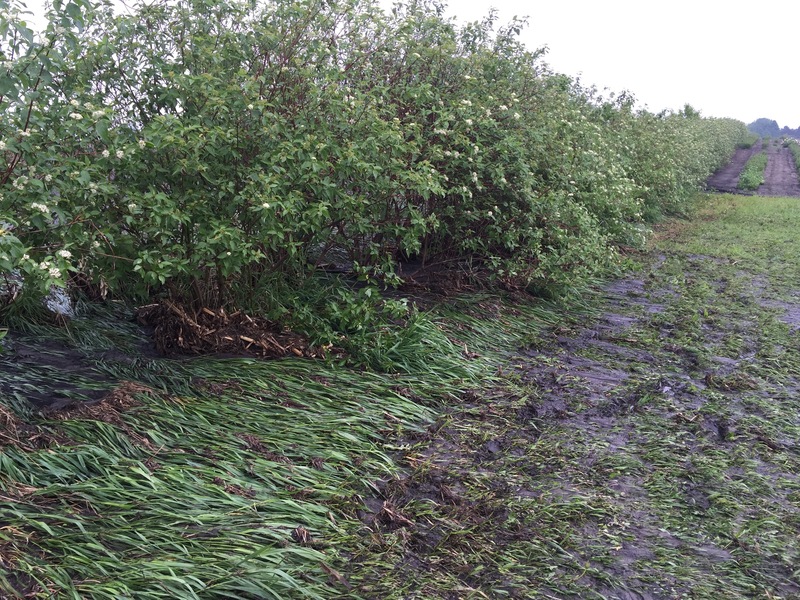 Thankfully all the peonies are on high ground but not sure yet what the wind and hail have done to our fields. I’m sure some of the non staking varieties are leaning over but all the intersectional hybrids around our home are still standing tall. 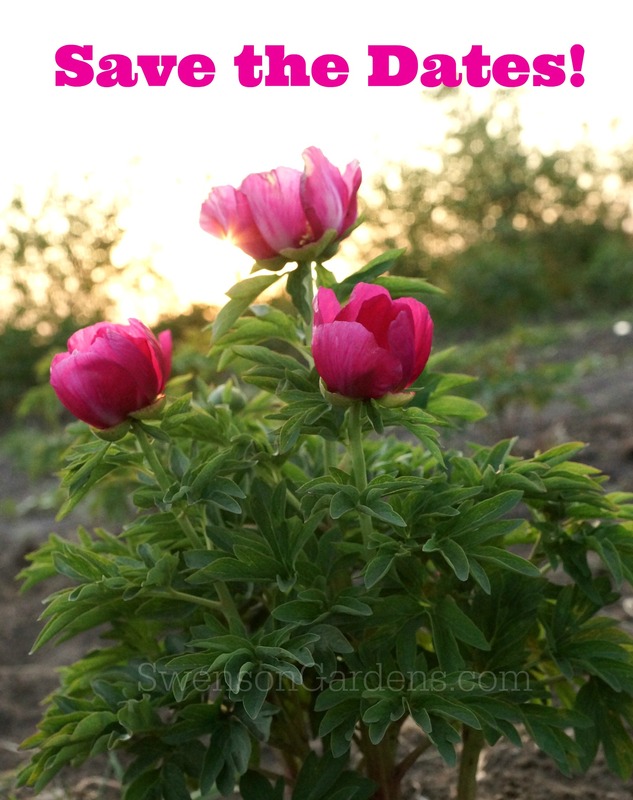 Greetings peony gardeners! Yes it is that time of year to announce some of the dates for our Peony Field Days. Save the dates – Friday, June 3rd and Saturday, June 4th from 9 am to 5 PM. We are not open Sunday. Our address is 10958 70th St SW, Howard Lake, MN. 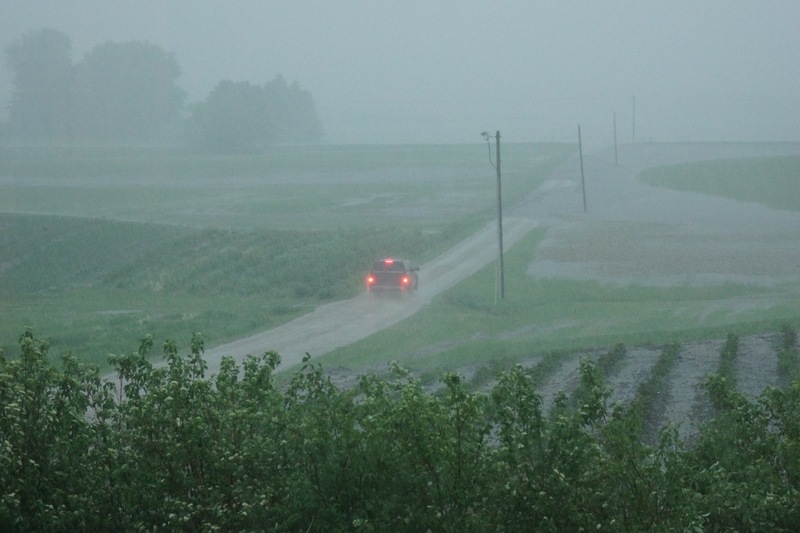 In case of severe storms (like we had one year), check on the Blog, Facebook or call us at 763.350.2051 for any changes to those days because of weather. I will be posting once we get closer to give you an idea on what’s in bloom. From my previous frost/freeze post, the peonies came through with no bud damage…again! We are still at the very early bloom phase and because of cooler temps we should be at peak bloom those days. We will be adding more days so check our Blog and Facebook for updates. Some of Roger Anderson’s tree peony seedlings are starting to bloom so in the next few years we may start to sell those. For now though we are selling named herbaceous and intersectional hybrid peonies. Now I do have to let those of you who are waiting to order at Peony Field Days and our online peony gardening friends that we have one inventory to sell out of. 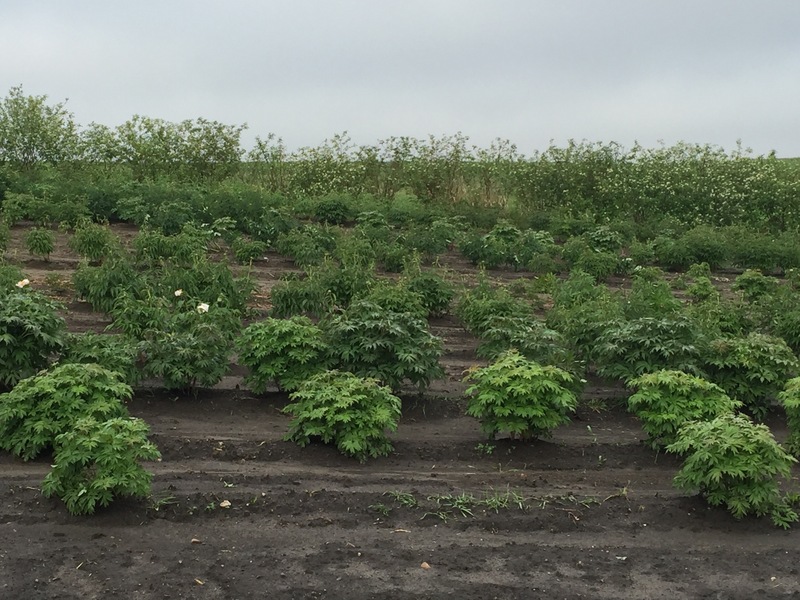 After and/or during Peony Field Days, some varieties will be sold out for the year. 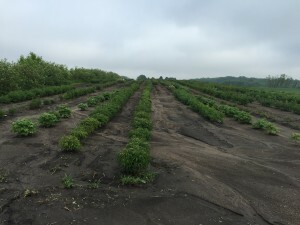 If you are local and plan to pick up your roots in the fall, you may want to go to our ‘how to order’ page and mail in your order now instead of waiting and then getting here only to find out the variety(s) you wanted to see and then purchase are sold out. This also is a heads up for our online gardeners that if you see that the variety(s) are not sold out online, you may want to order now instead of waiting until after our Peony Field Days. 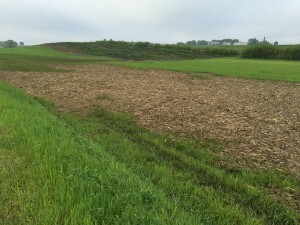 For those of you who have been to Peony Field Days in the past, the field we normally had it in is almost no more. 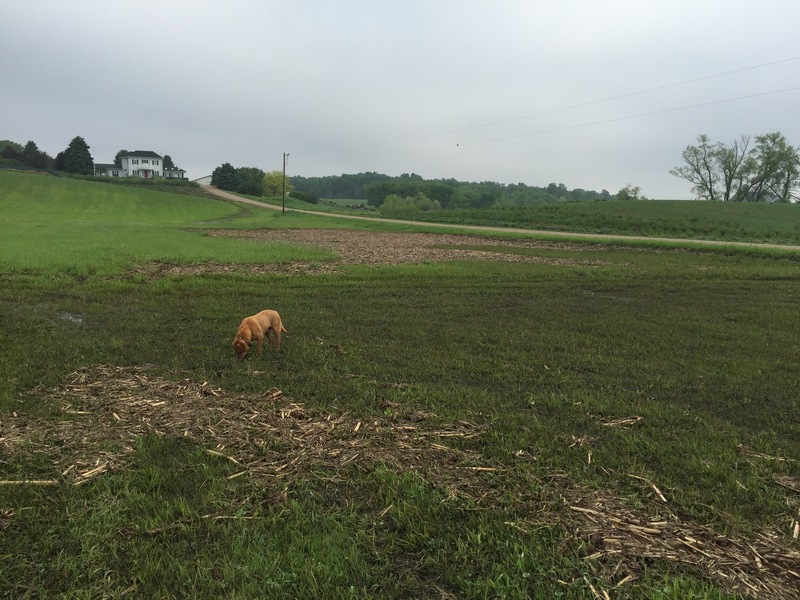 We are in transition with that field and this years field will be on the west side of our driveway. Parking has also changed as we have an area to park on the east side of our driveway as you first turn off of 70th St. A mini biff will be available and look for our big white canopy. For those of you who may be physically challenged we have two options: 1) A level parking area will be located near our white canopy that can be easily accessible. 2) For those of you who may not be able to do that, you are still welcome to drive up our driveway and enjoy the fields from the comfort of your car or van. (There is a turn-a-round at the top of the hill past our home.) Finally, we welcome children and pets as long as they are on a leash (dogs that is) and picked up after any business (hopefully still dogs but we do understand if not). We do ask that both children and pets are under direct supervision as we want to make this an enjoyable and safe event for all! Staff will be on hand to answer most of your peony growing questions so come on out to Swenson Gardens Peony Field Days! We have an extremely busy weekend with our sons graduation and apologize for this late post on Zones 3 and 4 freeze watch/warning tonight. As mentioned in a previous post, our experience has been three nights of 19 F degrees or less that will damage the peonies for that specific year. Needless to say they still came up the next year. 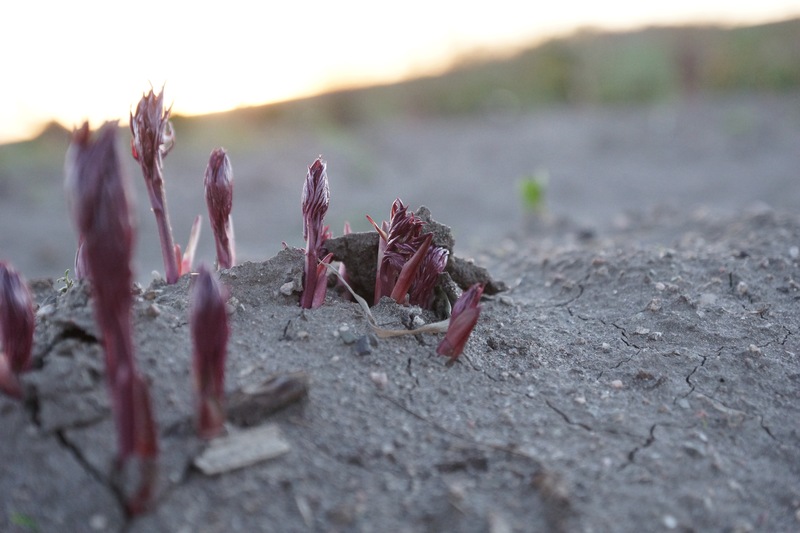 For some of you who have been contacting us on peonies planted last fall, we suggest you remove the first year buds to put all stored energy into root production for the next year. What may a late season frost/freeze do to peonies in the bud stage? Well unfortunately that may damage the buds and prevent them from blooming and/or the blooms will be stunted. Time will tell after the colder temps tonight and tomorrow night. You may see the buds turn brown and if they do, snip them off as they won’t bloom. We saw this happen about 10-years ago in the fields and the two nights of mid to high 20 F degrees took out about 50% of the blooms. The foliage and stems were ok but the delicate buds did not fare so well. Then the next year we had massive amounts of blooms as the energy went into root production amazed us beyond belief. The resilience of peonies are unbelievable! As far as covering peonies, well it doesn’t hurt in home gardens! Will the late season frost/freeze kill the peonies? Apparently in our case it did not. 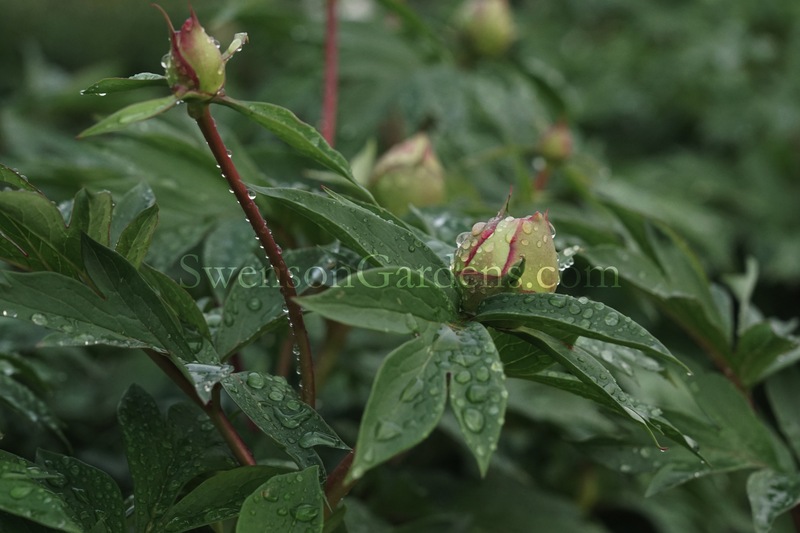 We ourselves just let the peonies weather the temps, storms and yes today we had a brief shower of ‘sleet’. YIKES! 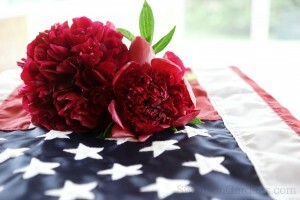 You got to love peonies! And the winner of the first peony bloom in 2016 is ‘Little Red Gem’. Congratulations on some much needed color in the fields. This particular area of the field receives full sun so that area is at least 2-weeks ahead of some other parts of the field. ‘Lil Sweetie’ was a close second and set a few blooms as well the next day. On Friday it was 94 degrees around 4 PM that spurred many a bud to explode on both of these varieties. Ok so we live in Minnesota, on Saturday morning the temp was 52 degrees! Yes a 42 degree temperature swing overnight. The weeding crew left early on Friday as it was just too warm too fast to make it enjoyable. Thankfully the temps are now back to normal and with this wonderful rain, peonies should settle down into a slower pattern of growth. Since both of the peonies that bloomed were very early varieties, Becky took this shot of of a late variety. Don’t you just love the different bloom times and growth of peonies! Make sure if your planning some new resting spots for peonies that you enter bloom times into the design so you can enjoy color over an extended period of time. In a normal growing season here, we can have a 7-8 WEEK period of color from the very early to very late varieties. Intersectional hybrid peonies like Bartzella can have two separate bloom times that provide color for 3-4 WEEKS. 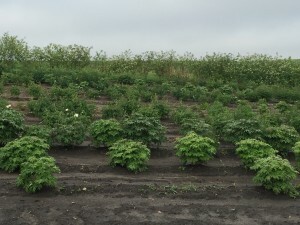 If you haven’t grown Bartzella that is originators stock and sold as intersectional hybrid peonies versus the tissue culture types that are found in pots, you really have to try our Bartzella.